In today’s modern dental landscape, one reconstructive service stands apart from the rest – dental implants. At First Line Dental, we strongly encourage patients with varying degrees of tooth loss to consider this state-of-the-art service, which provides outstanding health benefits in addition to seamless aesthetics, durable function, and much more. 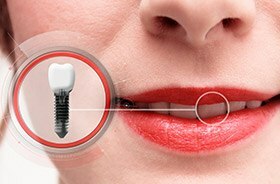 To learn more about dental implants and how you can start working towards the confident, re-completed smile you deserve, don’t hesitate to schedule a free consultation with Dr. Stanko here in Manchester, CT.
Why Choose First line dental for Dental Implants? While the white crown that shows in your smile may be the star of the show, a tooth’s natural structure extends beyond it. Below the gumline, you’ll also find a root that stimulates the jawbone and provides a reliable foundation. When a natural tooth is lost, this root disappears as well, and while traditional tooth replacement services like bridges and dentures faithfully recreate the crown, they ignore this equally important component. This can lead to jawbone deterioration and a higher risk of additional tooth loss over time. Thankfully, dental implants prevent these consequences and help your overall oral health stay strong by replicating the root first. Implant-retained teeth are also virtually indistinguishable from natural dental structure once completed in every way, from overall feel to appearance to function. 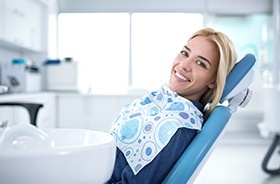 They can last for multiple decades at a time with the help of proper maintenance, and many patients are able to enjoy their brand-new smile for the rest of their lives – no replacements required. Whether your smile contains a single gap or several, dental implants offer a high degree of versatility. They can be successfully paired with several different types of restorations, and our team will help patients decide which option is the right fit for their goals and personal preferences. 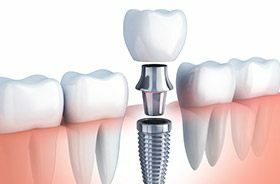 If you are only missing one tooth, an individual implant can be paired with an all-ceramic dental crown. Not only is this restorative option beautiful, but it can fit right into place alongside natural teeth without anyone being the wiser – and without harming the nearby natural dental structure too. All-ceramic dental crowns can be successfully placed over dental implants in several areas of the mouth, but a more cost-effective option may be to replace consecutive lost teeth with an implant-retained bridge. This style of lifelike prosthetic is securely anchored in place with two dental implants, each one placed on a different side of the gap. If we need to replenish an entire arch of your smile, implant-retained dentures can provide full, reliable coverage. Instead of replacing each individual tooth with its own implant, a small number of implants are strategically positioned instead to provide optimal support to the denture. This style of prosthetic can be permanently fixed in place or left removable. 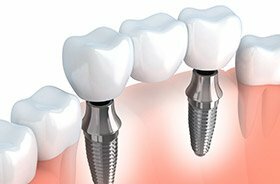 There are several components of dental implant treatment that can contribute to the overall cost, including the initial surgical placement of the implants, the addition of one or more abutments (connectors), and the style and number of custom-made restorations that are needed. 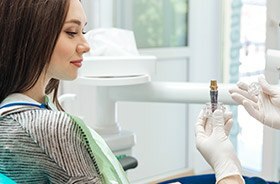 Every patient’s situation is unique, which is why we want to invite you in for a FREE consultation first. After our team has performed a comprehensive evaluation of your oral health, we can provide a clear price estimate for your procedure. Please keep in mind that while dental implants may seem expensive at first glance, it’s important to think ahead to the future. 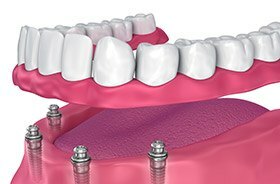 Traditional dentures and bridges have a lower upfront cost, but they are very likely to need extensive upkeep and even full replacements in later years, while dental implants are designed to succeed for decades. We consider them an investment worth making, and we look forward to guiding you through the process.